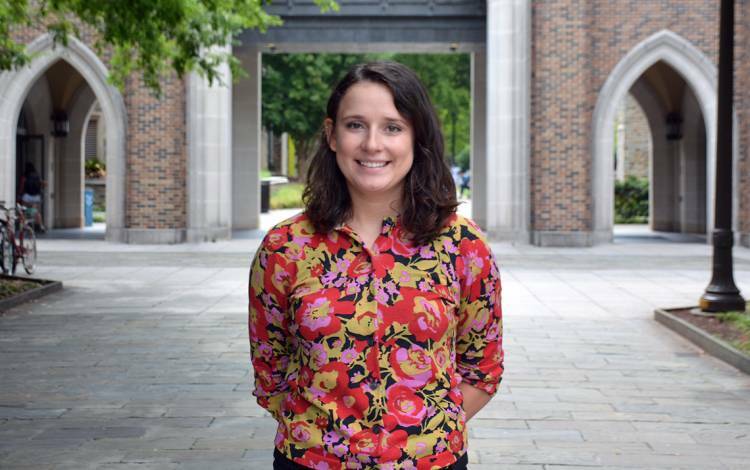 Libby Dotson ('18) participated in DukeEngage in 2016. A study abroad opportunity in her sophomore year led Libby Dotson to her first job after graduating from Duke in May 2018. Through Desarrolla, a Duke student organization that does research and service projects in Latin America, Dotson traveled to San Andreas, Guatemala, to provide renewable flashlights to an all-girl’s boarding school. When the summer was over, Dotson took an independent study to write a report on how the school used the flashlights. “The doors kept opening for me when I was persistent about the things I was passionate about,” she said. “Before I knew it, the [Center for Global Women’s Health Technologies] asked if I wanted to stay on as a full-time research fellow. Dotson is now helping the Duke Center for Global Women’s Health Technologies curate an exhibit on women’s health that will be on display at the Rubenstein Arts Center in the spring. She’ll also be scheduling a clinical study in the fall for women to try devices that replace the speculum. Write-up courtesy of Jonathan Black, Working@Duke, as featured by Duke Today. Libby completed a DukeEngage Independent Project with Intiwawa in San Isidro, Peru, in 2016. The following summer, she was awarded a RIPP-Engage Fellowship to work with Instituto Indigena Nuestra Senora Del Socorro in Sololá, Guatemala.